A pro soccer team for the Capital Region? Sure, in some form, why not? Every now and then we see the idea of the Albany area getting a pro soccer team pop up during a discussion. And, yeah, that could be a lot of fun. Of course, when most people think "pro soccer" for the United States, they think MLS. And that... well, that's not going to happen in the Capital Region anytime soon (if ever). Here's why, along with some other options for pro soccer that look a lot more likely. MLS for the Capital Region? Almost certainly not. Let's just play this direct: The Capital Region would not be in line for an MLS franchise because it just doesn't have the population. Team info via Wikipedia. | Metro populations via US Census and Statistics Canada. As it happens, a lot of the modern soccer-specific stadiums used by MLS teams aren't really all that big. The smallest, in terms of fan capacity, only seat about 18,000 people. And while the Capital Region doesn't have a venue that big, it probably wouldn't be too hard to upgrade a place like UAlbany's Casey Stadium to about that size. That said, it's unlikely MLS would be on board with one of its team sharing a non-soccer-specific stadium with a college. FC Cincinnati, which is joining MLS next season, currently plays at a University of Cincinnati stadium and draws very well there, but getting its own $200 million soccer-specific stadium was a key part of getting accepted into MLS. Another thing a Capital Region MLS team would need: A very rich person (or people) who's interested in soccer -- or, at least, sees a team as a worthwhile or diverting investment. The entrance fee for joining MLS for Cincinnati and Nashville (which will join in 2020) is $150 million. That's on top of a stadium and, you know, actually running a team. To go along with that, an MLS team would require corporate sponsorship and a bunch of people willing to pay for season tickets. MLS isn't the only the option, though. There's also the United Soccer League or USL. It's officially sanctioned as a second devision league by the governing body for US Soccer. Second division in that it's one level below MLS on the country's soccer "pyramid." It's sort of like the Championship to the MLS's Premier League. Sort of. More on that in a second. Though it's not MLS, it's most certainly pro soccer, with paid players and coaches and all that. 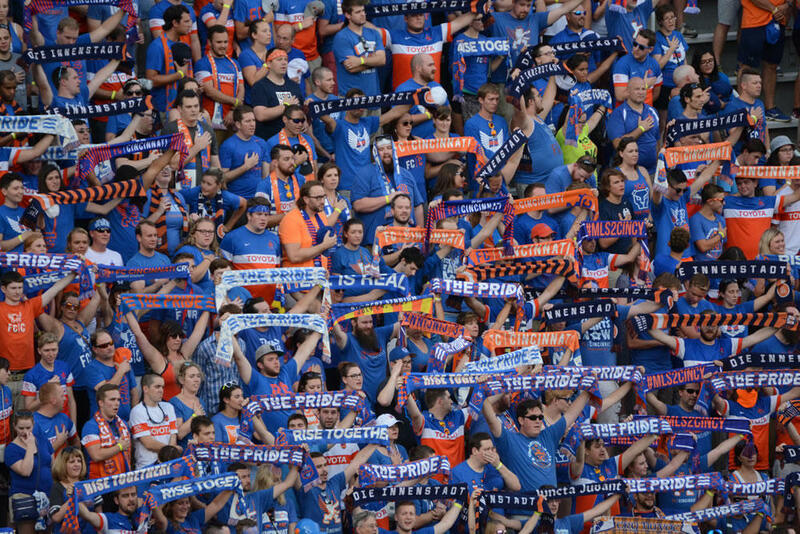 In fact, some MLS teams -- among them FC Cincinnati -- have grown out of USL. And a handful of MLS franchises have what are essentially farm teams playing in USL. Albany would be among the smaller USL markets, but not the smallest. And many of the teams play in stadiums with capacities that range from 5,000-10,000 seats. Casey Stadium could already accommodate that, and building a soccer-specific stadium of that size probably wouldn't be a huge stretch (though it's still going to cost millions). Even so, a USL team will take someone with a lot of coin. The USL expansion fee is said to be $5 million. An Albany USL team is probably not likely -- but it's not a totally crazy idea, either. There's yet another option that sounds a lot more attainable: USL Division 3. + Pitch Size: 110 yards x 70 yards??? Sure, that could be Albany. Again, it's going to take someone with money they're not too worried about losing, and a few other key pieces would have to come together. But a USL D3 franchise here sounds realistic. OK, yeah, that maybe doesn't sound super exciting. But as minor league baseball has shown -- and the ValleyCats demonstrated locally -- lower-division pro sports can be fun. Also: This isn't a huge metro area, you've gotta work with what you got. The prospect of a third-division pro soccer team could be more enticing if there was at least a glimmer of hope for something bigger. In other countries, that's present in the form of promotion and relegation. It works a little bit differently in each country, but essentially in pro/rel the top teams in each division move up the soccer pyramid after each season and the bottom teams drop down a level. The United States does not have this system, which is the source of ongoing debate and frustration among a segment of soccer fans here. The biggest reason is that MLS is not on board, and there's a not-bad argument for that position given how precarious the state of the league has been over the years and the fact that soccer still isn't one of the country's most popular mass viewership sports. The idea of investing hundreds of millions of dollars in the league is less appetizing when your team faces the possibility of being relegated to a second division that many sports fans probably don't even know exists. But here's the thing: The USL president has said that "it would be very interesting to look at pro-rel between" USL and USL D3. So, let's say USL establishes both USL and D3 and they're sustainable. And let's say it institutes promotion and relegation and that works. If you squint, you can maybe see a future where those leagues end up being connected to MLS for promotion and relegation. Maybe. Sometime. Out in the future. And then there's a path for Albany to make it to the top flight. We've joked that Albany's favorite sport is politics. And this area hasn't exactly been a field of dreams for pro sports teams. Maybe this just isn't a sports town -- or, at least, not in that way. And if that's the case, that's totally fine. An area doesn't need pro sports to be successful or interesting or noteworthy. + Dennis Crowley, a founder of Foursquare, has been taking a more DIY approach to building a soccer franchise in the Hudson Valley, and he's been writing each season in detail about the economics and operations of Stockade FC. This sort of team is probably very feasible for this area. + Albany had a pro soccer team -- the Albany Capitals -- back in the 1980s. Albany's had several pro soccer teams over the past few decades, all of whom had decent records but struggled mightily at the box office. The New York Eagles (American Soccer League, 1979, 1981) and the Albany Capitals both played at Bleecker Stadium, which is already cavernous for any sport it hosts. The Eagles were also essentially a transplanted team from Yugoslavia, and once the players left Yugoslavia for Albany, they stopped being Yugoslavs and became Serbs and Croatians and Macedonians, and the Serbs would only pass to the Serbs, and the Croats wouldn't pass to the Macedonians, etc. There was also the New York Kick indoor soccer team, which won maybe four games in its one year at the arena in 1990 or 1991, if I recall correctly. And we did have a Div III level USISL team in the Albany Alleycats, but the less said about that team, the better. I'm not really plugged in to the USL scene any more, but in the early 2000's when the top tier of USL was referred to as the A-League, Rochester had one of the elite franchises, and Syracuse had an expansion team, The Salty Dogs. Kind of crazy considering they built a new stadium in Rochester last decade to cater primarily to the Rhinos. Challenges aside, it would be interesting to see a D3 operation develop in the Capital Region. We have some great college teams that nobody goes to watch. Great article really fleshing out the entirety of what a pro-soccer team in 518 would entail. I'm a big follower of NYCFC and would love for them to create a lower-division team upstate, however for the reasons stated above and the apparent lack of caring about pro sports in this town I am doubtful on that reality.